It’s full on fall, and it’s time I’m in Germany once again. I’m very enthusiastic about the train, and my attachment to Deutsche Bahn’s cross-country trains remains. I’ve purchased a 2nd-class rail pass for ten days (within a one month interval) for USD $345, which includes a promotional 25% discount for this year’s 25th anniversary of the fall of the Wall. It’s a question everyone asks, and the following comparison will show that the answer is yes. In the following table, I’ve listed point-to-point fares. I checked fares for the individual “legs” for specific dates on the Deutsche Bahn website, taking note of the lowest and highest 2nd-class fares in both “Sparangebote” (save offers) and “Normalpreis” (normal price) categories. The last farecheck occurred on 23 October (2014). I estimated distances using “Route” (road distances) values returned by the Luftlinie distance calculator (in German). “Hbf” is the abbreviation for “Hauptbahnhof” or “main train station”. The Rail Pass does not restrict the passholder to a specific train on a given date and time. To save the most money, purchasing individual Sparpreis fares ahead of time would be the way to go. I could save money by purchasing individual “Sparangebote” fares well in advance. Otherwise, there are generally available “Normalpreis” fares, which are less restrictive but more expensive. The price difference between Sparangebote and Normalpreis fares is much larger with long-distance rail journeys over 250 km; that’s always been the case whenever I’ve visited Germany and I’ve had to cross the country by train. I want the schedule flexibility, and that’s why I purchase a Rail Pass in advance. If I decide to stay longer or leave early, I can’t change a “fixed” ticket without incurring extra fees. My 10-day Rail Pass allows me the freedom to take a train on any day at any time (up to the maximum of 10 days. My desire for this versatility will save me at least USD $350. Deutsche Bahn lists the following conditions for their two categories. Sparangebote: Preis für alle Reisenden. Bei Aktionsangeboten und regionalen Angeboten gelten besondere Konditionen. Zugbindung, d.h. Ihre Fahrkarte ist nur in den auf Ihrer Fahrkarte aufgedruckten Zügen gültig. Umtausch und Erstattung 15 EUR; ab 1. Geltungstag ausgeschlossen. Normalpreis: Preis für alle Reisenden. Volle Flexibilität (keine Zugbindung/unabhängig von der angegebenen Verbindung auf der gewählten Strecke). Umtausch und Erstattung kostenlos, ab dem 1. Geltungstag 15 EUR. Savings offers: price for all travelers. Conditions apply to special and regional offers. Your ticket is valid only as printed for the specified train. 15 EUR charge for exchange or refund before the first valid day; no exchange or refund afterwards. Normal price: price for all travelers. Full flexibility (no specific train / regardless of specific connection on the chosen route). No charge for exchange and refund before the first valid day; 15 EUR charge afterwards. Disclosure: No Connection, Unpaid, My Own Opinions. I have not received any compensation for writing this content and I have no material connection to the brands, topics and/or products that are mentioned here. The first two photos are from Wikipedia, and the last two are from Flickr. All photos are used with the generosity of the Creative Commons license. This post appears on Fotoeins Fotopress at fotoeins.com as http://wp.me/p1BIdT-5y9. Great breakdown Henry! I’ve never had to figure out the cost / benefits of getting a rail pass before so this is really interesting to see. Hi and thanks, Adelina. Sometime ago, someone told me they were unconvinced by any savings with the advance purchase of a rail pass. But that depends on how much or how often a person wants to travel with the train, and how long those individual train trips will be. 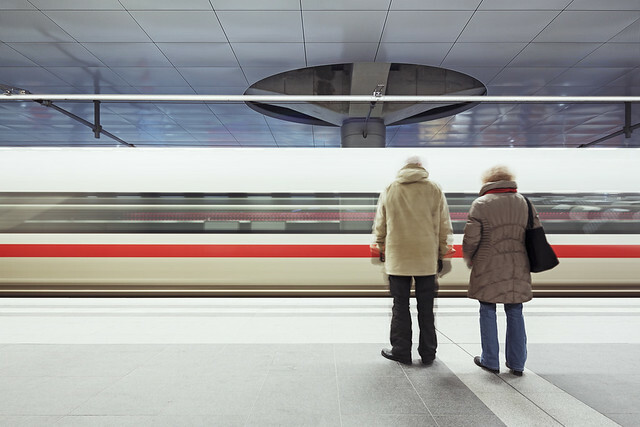 Long-distance journeys yield more savings with a pass, especially in Germany. Unfortunately, the English version of the Deutsche Bahn website does not always allow the kind of specific searches and comparisons I want to make. Fortunately, I understand enough German to have done the work on the full-version of their website, and I’ve written this post for all to see 🙂 I hope it’s useful to you and to others who might be curious about a European rail pass. Thanks again for reading and for your comment! Hi and thanks, Sophie. I don’t have many complaints about Deutsche Bahn, although it’s interesting that the perception is they’ve gotten worse, either by monopolistic practises or by response to competition to smaller train companies and to recent entry into the market by coach (long-distance bus) services. Their website is still very good and comprehensive; it’s a lot better to use if one understands a little more German. As you’ve also written, it’s fun to see how some of the EuroCity (EC) and InterCity Express (ICE) routes go into Germany and out to neighbouring countries. Thanks again for reading and for your comment!